Small update: I'm involved in a group author interview for the Crossover Alliance. You can find it here. You might guess what I'll say, or not. Either way, there are other authors being interviewed. Check 'em out. There are some interesting stories with backgrounds of there own. Thanks to Sakuya Quinzelle (@SakuyaRed0) for help visualizing the design! The Seeker has no super strength, telekinesis, or Batman's utility belt. But what he has instead is an ability far beyond what anyone else could expect. Who knows, I might even get to explore it further in the future. You will see other heroes with strange powers first. This world is shaping up to be a bit different than you might expect for a superhero universe-- if you've read the story you might know what I mean. But that's for a future post. So give the story a shot and I'll be back before you know it. My first ever published work is now out for everyone! So here is a short update post involving the anthology it's in. One of the authors has an audio version of his story in anthology. You can find it here. The Crossover Alliance has also put the anthology up on several other sites including Barnes & Noble in paperback and Nook, Amazon paperback and Kindle. There's also an entry on Good Reads. I'm currently trying to deal with amazon changing things around since my author name is actually "JD Cowan" and not "J.D. Cowan," but you know how slow they can be. Hopefully they'll get that fixed up soon. I wouldn't bet on it. 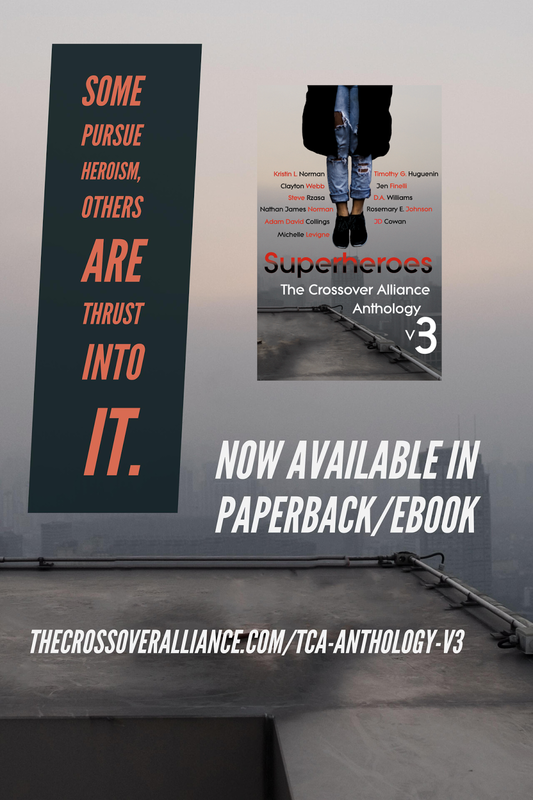 This collection is about superheroes but with a Christian bent. This doesn't mean message fiction, though. It uses Christianity as a moral and spiritual backbone to form the story settings. I would actually be curious if anyone can see where the Christian elements in my story are. It's quite the unique idea for a collection. In other news, I've still got a bit more Lent to go through. I'm chomping at the bit to listen to some of the podcasts and posts I've missed, but that will have to wait. Still, if you need to contact me for any reason I will answer. Anyway, if you like superhero stories then please give this a read and let me know what you think. I have other superhero stories in other stages of development so I would really like to know what works and what doesn't for readers. In the meantime, I'll just keep writing. Have a good week, and I'll see you soon enough. Remember when I said I'd be posting an update or two? Well here's the first one. 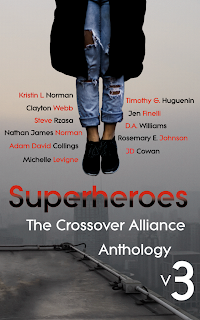 I little while back I submitted a short story for an anthology It was about superheroes. The story was accepted. Now I have the pleasure of officially revealing it here! The Crossover Alliance is a bit of an oddity, which is why I submitted to them in the first place. Though they are a Christian publisher, they do not publish "Christian Fiction" as such. Being as unfamiliar with that whole market as I am, I mainly submitted because of their adherence to storytelling with a purpose beyond preaching or subverting norms. They were looking for stories about finding light in the dark. I couldn't resist that. Though I am a Christian, I did not grow up as one. This is why my tolerance for message fiction, even of what I believe, is not very high. However, the Crossover Alliance is dedicated to stories above all. They accepted my tale despite no message smacking you in the face. 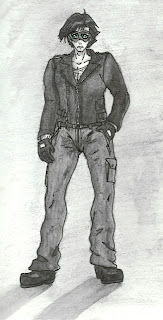 The story I wrote is entitled Someone is Aiming For You and is about a superhero called "The Seeker." He operates in the fictional city of Summerside. The Seeker is a myth in the city due operating in the shadows and for the impossibility of his abilities. What can he do? With a touch he can see into his target's past, and can transform his appearance into whoever he likes. Having one power is rare enough in this world, but having two is impossible. But this ability has a side effect. When he uses his touch, ghosts appear out of the darkness of night to meet his target. The Seeker pries into the past of his victims, but part of that past comes out of them in the process. These visions confront the targets with memories that refuse to stay buried. Or maybe they're actually something else? But the Seeker cannot see these visions his victims see. He can only use it as a tool in his quest. In this world superheroes and magic are two separate and deadly forces, but the latter is hidden from sight. The Seeker is a crusader (an illegal hero) who hunts this dark magic and exterminates it. In a world where official heroes battle with villains, he deals with something entirely different. The Seeker is a myth that battles with myths. Those who know me probably understand where this character came from. The Seeker is a response, of sorts, to a handful of different heroes. He is a mirror of the Shadow who can cloud men's minds; The Seeker reveals truths that men hide even from themselves. He is a reflection of the Question who seeks answers; The Seeker knows far too many answers and holds onto the truth. He is an echo of Daredevil who traverses a world on fire; The Seeker is always just outside unable to see what he unleashes. There are many differences between these heroes, but their similarities are what drew me to each of them. As a fan of all three, the Seeker was a pleasure to work with. But don't take my word for it. Read the story yourself. It will be out when the anthology launches at the end of the month. Clear your schedule and give it a shot. It's sure to be a great time. The anthology officially comes out on March 28th and will be available in kindle and paperback. You can preorder it on kindle on their website now for a slight discount before release. Hey there. After doing some reflecting I realize that I have been spending far too much time online. For Lent I've decided to take a break from posting online and on social media. This is good for me too, since I have other things to worry about. But I do have a quick update or two I will post so the blog won't be completely dead. Still, don't expect much to come from this blog until April. "This is just how I feel personally, but the most exciting part of any superhero movie or comic is the process of becoming a hero. And I mean "exciting," which goes a level beyond "interesting" in how it creates a sense of anticipation. "So I set out to make a story about becoming the greatest hero there ever was that would perfectly capture that excitement, even for myself as the author. "The stage for that was set way earlier than expected, but I've still got a ton of story in me, so I'm going ahead at full throttle." And this is where we are in volume 7 of My Hero Academia. If you thought things were heating up in volume 6 you ain't seen nothing yet. When we last left our heroes, Midoriya, Ida, and Todoroki, were doing battle with Stain the Hero Killer, and were on the ropes. Volume 7 finishes the battle and ends the Hosu City Incident in a brutal and dynamic way. The world of My Hero Academia will never be the same. To fans, this battle is when My Hero Academia went from a great series to an excellent one. You have separate threads connecting to each other, a thrilling battle of good and evil, incredible detailed art (and this is a weekly series, don't forget), and the start of upped stakes that Kohei Horikoshi takes to heart. Everything is on the line here. This is top shelf material. But the battle with Stain and the aftershocks, which take place over half the volume, as incredible as they are, don't slow the pace down whatsoever. There is no down time. The story continues on, continuing to ramp up the scale. As you've noticed from the cover, just as with volume 5, this is the second cover to not have Izuku Midoriya, the main character, on it. Just as that volume was called Shoto Todoroki: The Origin (which came back in a big way during the Stain fight), this volume is called Katsuki Bakugo: The Origin. Horikoshi's covers when focusing on one character at a time are quite incredible, and this is no exception. There's a really nice one coming up, but I can't mention it for fear of spoilers. Trust me, these covers are always great. Bakugo, despite his early characterization, is a much better character than you would first think. Horikoshi does not sit on him as a stock bully character. Bakugo is thought as, even by his teachers, to be going down the wrong road and away from the path of good. It's easy to think that. He had been going the wrong way when he was young and got his quirk. In the first chapter and at the start of the series, he's a chump. He was arrogant, a bully, and had a volatile personality as a result of life not working out the way he wanted it to. That was the way it was. Until he was surpassed by Izuku Midoriya and continued to be time and time again. Super special Bakugo is really just a boy with a good power, and little else. And Midoriya annoys him because the weakling was nothing special before he got his quirk: he was just a pebble in the road toward Bakugo's deserved greatness. Yet, he keeps getting in the way and reminding him what he is not. What is it that Midoriya has that even All Might sees? What is Bakugo missing, and how can he find it? This leads to two things. 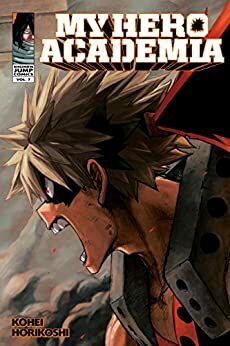 The first is a great confrontation at the end of this volume where Bakugo teams up with an unlikely ally against an unlikely enemy, and the first tease of a very important event to come later in the series. Suffice to say, there is more to Bakugo than what you see on the surface. Don't get me wrong: he's still a jerk. His behavior is not justified, or ever thought of as anything but repulsive for a hero. But very slowly, it appears that he knows it himself. He knows he is insufficient to be a hero. Watching Bakugo grow from an arrogant bully into a hero should be just as fun to watch as Midoriya has been. One of Horikoshi's strengths is to never rely on cliches with his characters. They might start with a simple personality like nerd, cool guy, or bully, but they always turn out to be more than that. Bakugo is a bully done right, and he goes beyond what you would expect. Whatever he eventually ends up being should be interesting to see. Unfortunately, Mr. Horikoshi once again leaves readers on a cliffhanger with this volume! This will have readers grinding their teeth, but I assure you that My Hero Academia is worth the wait. Volume 8 will be worth the wait. It's currently over 120 chapters long and is still the best running manga out there. In other news, season 2 of the series is a month out. It might even cover material in this volume. Suffice to say, if you enjoyed season 1, you're definitely going to want to catch this, especially if the rumor of it being twice as long as season 1 is true. Fans are in for a treat. My Hero Academia just gets better and better as it goes. Here's hoping 2017 is the year the series finally achieves mainstream recognition!